Location: Kintyre, Argyll and Bute, Scotland. Ownership / Access: Landmark Trust. 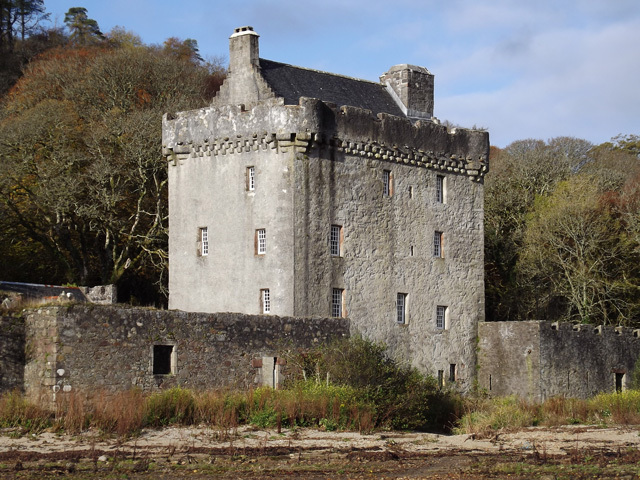 Notes: Saddell Castle is a 16th-century tower house on the shore of the Kilbrannan Sound near Saddell, Kintyre, Argyll and Bute, Scotland. Built by David Hamilton, Bishop of Argyll, between 1508 and 1512, the castle was built from the stones of the ruined Saddell Abbey. The castle was gifted to James Hamilton, 2nd Earl of Arran by Bishop James Hamilton, as payment of debts and taxes in 1556. The Earl of Arran exchanged it with the Chief of Clan MacDonald of Dunnyveg, James MacDonald in exchange for James's lands on the Isle of Arran. The castle was ransacked and burnt in 1558 by Thomas Radclyffe, 3rd Earl of Sussex, Lord Deputy of Ireland under orders of Queen Mary I of England in retaliation of James's involvement in Ireland against the English. The castle was later rebuilt and enlarged together with a trap door in the main entrance passage, which upon activation, sent unwanted visitors into a dungeon which had no exits. In 1607, the Clan Donald lands in Kintyre, including Saddell, were conveyed by King James VI to Archibald Campbell, 7th Earl of Argyll. The castle fell into disrepair when Saddell House was built c. 1774. The castle was bought by the Landmark Trust and the castle was restored. The castle can be rented out as a self-catering property from the Landmark Trust.